These Portofino bar stools are a great addition to your outdoor area, and are updated with arm rests and an exposed back for design and superior comfort. Host your guests in style in your outdoor seating space with a commercial grade stool set to enhance your bar, kitchen island, or entertaining area. Designed to coordinate with the best-selling Portofino Collection. Set includes two bar stools. Air lift barstools features a powder-coated aluminum frame and Espresso woven seat top. 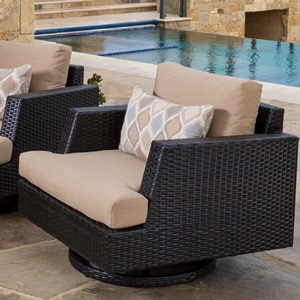 Woven seating surface is a 21-inch square base with a low exposed back and arm rests for added support. The activation lever allows you to adjust the height to suit your needs between 30-38 inches. Foot rest provides an extra level of comfort.